Northeast Championship Wrestling returned to the Knights of Columbus Hall in Foxboro, MA for the 4th annual Fight in Foxboro this past Saturday night, the final stop before NCW’s 16 year REUNION April 26 in Norwood, MA. – “The Hard Rock Hellraiser” Todd Sople d. “The World’s Fittest Man” Dan Terry in the opener, knocking Terry out with his ‘whammy bar’. – The Shadow w/ “Black Magic” Sean Feeney d. the Lumberjake w/ Niki V after Feeney assisted in a distraction on Lumberjake. Following the match “The Maniacal” Jack Krueger & “The Twisted Hatter” Alex Creed then came out to assist in the beat down on Lumberjake. Announcer Tom Warren then bravely entered the ring to get a couple of words with Maniacally Twisted, who still had the Loomis’ Tag Team titles. Maniacally Twisted promised to become the true champions tonight. – Pacifico w/ Big Bully Rezner d. “RIOT” Kellan Thomas w/ Kepler after Bully interefered on Pacifico’s behalf. 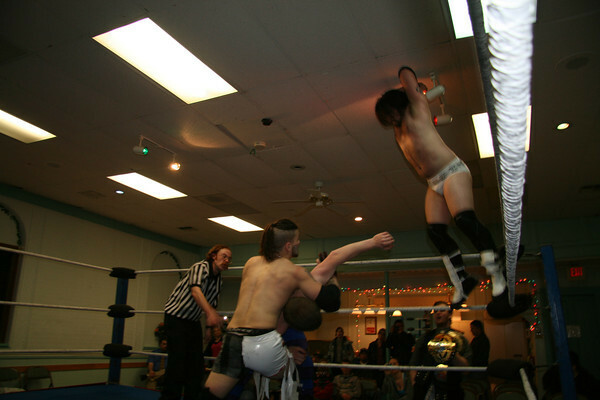 Originally scheduled to be a tag team match, Kellan’s tag team partner Mike McCarthy did not appear for his match, leaving “RIOT” against both guys. – “All Good” Anthony Greene d. “The Original Showoff” Mike Paiva, making him 3-0 against the former NCW New England Champion. A frustrated Paiva attacked Greene following the bell, and landed a vicious piledriver on the 2012 Rookie of the Year. Paiva then took AG’s award, and delivered another piledriver right onto his plaque, shattering the glass. 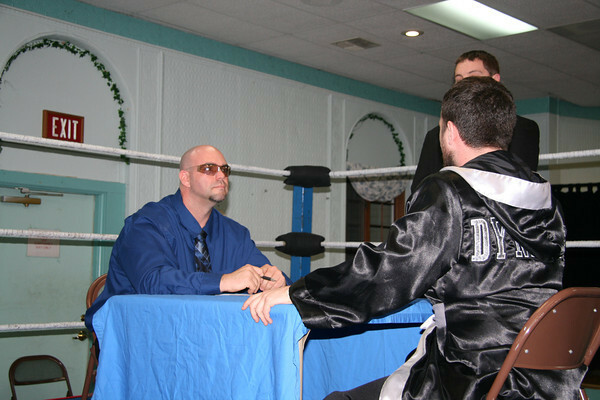 Todd Sople then came out to help AG, and challenged Paiva to a match at NCW’s 16 year REUNION. – El Saguaro d. Steve “The Turtle” Weiner after a low blow behind the referee’s back. This match will be held under Street Fight rules. No count outs, no disqualifications, and anything goes. If any wrestler, manager, official, or employee of Northeast Championship Wrestling intervenes in the contest they will be terminated from NCW immediately. The winner of this match will be named Commissioner of Northeast Championship Wrestling. Despite his reservations Livsley agreed to all the stipulations, and promised to teach Summers a lesson he’ll never forget April 26 in Norwood. – “Simply God’s Best” GA West came out for his match, but was soon interrupted by Doc Ozone. Doc O talked about firing GA in Riverside, and said that the manager was bigger than the wrestler and could make anyone into a champion. Ozone then announced his client for the evening– Too Shay! – Too Shay w/ Doc Ozone d. “Simply God’s Best” GA West in a huge upset after Doc O cost his former charge the match. – Rob the Giant d. “Dynamite” Doug Summers when Dean “The Beast” Livsley restarted the match after Summers used a foreign object on Giant to win originally. – The Loomis Brothers d. Maniacally Twisted w/ Sean Feeney via disqualification when Krueger & Creed used the Tag Team Championship belts as a weapon against David & Eddie Loomis. This brought out the Shadow to help join in the beat down, leading to the Lumberjake coming out for some revenge of his own. The tide quickly turned when Pacifico & Big Bully Rezner arrived on scene to assist in the carnage, but out of nowhere “You’ve Got The Touch” hit the PA and “The Portuguese Sensation” Ruy Batello returned after two months on the disabled list to single out “The Maniacal” Jack Krueger and Alex Creed. The rest of the NCW locker room then poured out as referee Redd Roche lost control of the situation, leading to a huge locker room brawl. For exclusive pictures from the Fight in Foxboro please check out Picture Dave’s photos here.